The United States government said in a statement last week that it was “deeply concerned” about the interference with the media, and the United Nations Office of the High Commissioner for Human Rights called on the government to “respect and implement” the court order to end the blackout. Raila Odinga before taking an oath as president during a mock “swearing-in” ceremony last month in Nairobi. In Kenya, some are now likening Mr. Kenyatta to Daniel Arap Moi, the authoritarian president who ruled the country for 24 years, before finally leaving office in 2002. Mr. Moi outlawed political parties, banned many foreign and local newspapers and magazines, and detained and tortured those designated as political opponents, including writers and intellectuals. But shutting down broadcast stations “never happened, even under Moi,” said George Kegoro, executive director of the Kenya Human Rights Commission, a nongovernmental group that is a leading human-rights authority in the country. The current tensions have their roots in last year’s presidential election, when Raila Odinga, Mr. Kenyatta’s longtime political rival, challenged his loss to the president. The Supreme Court ordered a new election, but Mr. Odinga withdrew before the second vote, saying the process remained unfair. The government said it would regard the action as treason, and Western diplomats pleaded with Mr. Odinga to cancel the ceremony. But he pushed forward with the “oath,” and the United States government, in a formal statement, stopped just short of denouncing the move as unconstitutional. Mr. Kenyatta summoned media owners last week and warned them not to cover the Odinga event at Uhuru Park, in downtown Nairobi. But on Tuesday morning, Kenya’s biggest stations broadcast live from the park before Mr. Odinga’s arrival. Government officials then disconnected them. Mr. Odinga did take the oath that day. On Wednesday, three journalists at NTV slept in the newsroom after being tipped off by police sources that officers were stationed around the building, waiting to arrest them. They spent Thursday night in a safe house, and on Friday, a court granted them anticipatory bail, effectively protecting them from arrest. So far, they have not been charged with any crime. Kenya’s president, Uhuru Kenyatta, accompanied by the chief of defense forces, Gen. Samson Mwathethe, inspecting a detachment of Kenya Air Force members in Nairobi last month. But by early Monday morning, it had still not complied. The government’s aggressive stance toward the media and the political opposition may have ended up lending legitimacy to what many observers had dismissed as political theater by Mr. Odinga. Last year, Kenyatta aides issued a directive to suspend all government advertising in four major newspapers, and several journalists have been fired for refusing to toe the government line in their coverage. 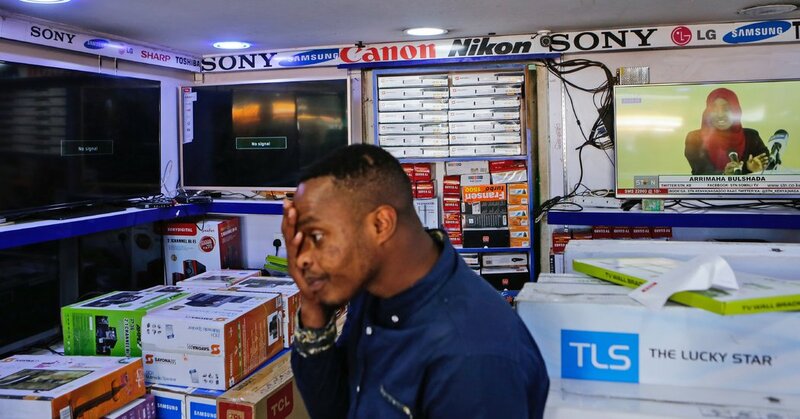 But the television blackout is universally agreed to be the most dramatic showdown between the government and the press in the history of Kenya’s young democracy. The shuttered stations reach nearly 70 percent of Kenyan viewers, according to the latest figures from GeoPoll, a survey firm. None but the wealthiest Kenyans can watch television online, where the stations continue to broadcast. Opposition supporters gathered before the mock “swearing-in” of Mr. Odinga. The government is discussing reopening the stations with the media outlets, conditioning a return to the air on their agreement to coverage restrictions, according to an official with knowledge of the confidential conversations. The media outlets deny any negotiations. If government officials continue to disregard the order to turn the stations back on, the court could cite them for contempt, or even order them jailed, lawyers say. If those orders are also ignored, that would be a clear sign of a weakened judiciary — and a teetering democracy. But a bigger concern now is whether the government takes action against Mr. Odinga. An arrest, many fear, might be greeted by widespread public resistance and set off violence — especially since the crackdown seems to have polarized ordinary Kenyans. Many have abandoned hope for dialogue between the two political leaders and are instead digging in behind the man they support. That’s the turn of events that Mr. Mutunga, the former chief justice, finds most worrying, because each political heavyweight could muster crowds of thousands to do his bidding. “I keep on having nightmares about a possibility of an ethnic civil war,” he said. Mr. Mutunga pointed to the widespread conflict that followed the 2007 election.